According to Varaha Purana, Lord Brahma’s son Kashyapa had four wives. Kashyapa’s first wife gave birth to Devas, second to Garudas, third to Nagas (snakes) and fourth to Daityas (demons). The third wife was called Kadroo, so Nagas are also known as Kadrooja. Kadru was mother of one thousand Nagas. Some prominent names being Sesha,Vasuki, Takshaka, Anant, Kanwal, Karkotak, Kalia, Aswatar, Padma, Mahapadma, Shankh, Kulik, Pingal etc. When all these snakes started tormenting human-beings, lord Brahma cursed them that they would be annihilated due to the curse of their own mother, but that is another story. The snakes got terrified and promised to mend their ways. They then requested lord Brahma to give them a place to live in. Lord Brahma instructed them to go to three different netherworlds-Sutal, Vital and Patal. 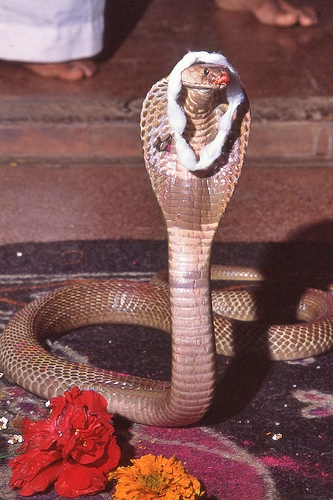 He also warned them that during Vaivaswat manvantar Janmejay would perform a grand yagya with the objective of destroying the wicked snakes but the virtuous among them would manage to survive. It was Shraavan Shuddh Panchami (The fifth day of the Bright half of the Hindu month Shravan-July-August). On that day the entire snake family got a new lease of life (see How the snakes were saved - A Hindu mythology). This day is considered a sacred day by Hindus. The festival Nag Panchami is celebrated on this day. The five Nāgas worshipped on Nag Panchami are Ananta, Vāsuki, Ta ak, Karkotaka and Pingala. Note: There are also several other legends associated with Nag Panchami.